There is no need to spend ages filling up a tank up with petrol, devoting time and effort to maintaining an engine and no messing around with potentially dangerous cords, thanks to our powerful, cordless grass trimmer. Simply pop in the powerful Series X2 40V lithium-ion battery and at a press of a button you are ready to go. 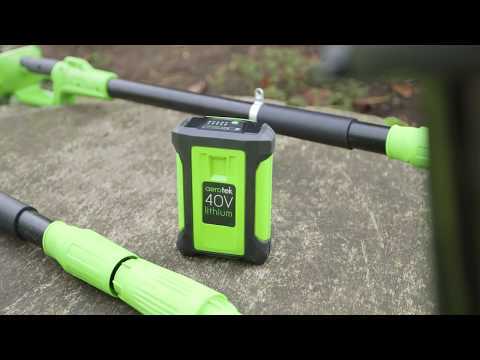 Thanks to the cordless nature of this grass trimmer there is no need to worry about being connected to a power source or accidently tripping over an unruly cable, giving you the freedom to work anywhere you may need to. Whilst you’re hard at work you can enjoy using this lightweight model as at only 2.5kg it’s both easy and comfortable to use. Also available to purchase separately are 50 metres of extra spool and a spare spool cover.